With passion and compassion, our customers will receive sincere real estate counsel and tailored service. We will provide creative and imaginative marketing that truly reveals the best of the property. Our priority, earn our clients business for life!! Toth & Team with RE/MAX Consultant Group is a residential real estate team that believes in teamwork, self-improvement, change, innovation, professionalism and always setting the next bar in marketing. We believe in producing results for our clients while maintaining the highest level of integrity. We believe in seeking out skillful and passionate service providers that are the best in the industry and love what they do! We believe in serving as role models in the real estate community and having fun while we do it! We believe in treating everyone that we cross paths with kindly and with respect. Each of us promises that if we ever stop loving what we do, we will recognize its time to change. Integrity: We conduct business with the highest level of ethics and trust. Team: We look for ways to build and maintain team spirit. We work together with an intense focus on common goals, recognizing we can always achieve more through collaboration. Community: We envision ourselves as valuable citizens in our community. We encourage our team to engage in volunteer activities and community improvement efforts close to their hearts. Personal Growth and Learning: We will seek ways to stay up to date on real estate information and technology and always try to improve our professional weaknesses. Passion: We approach everything we do with energy, enthusiasm and a sincere desire to exceed expectations. Joe Toth has owned an electrical contracting business for over 20 years. He studied and received his real estate license in 2004. Joe's gift of running a successful business has made him quite successful as a Realtor. 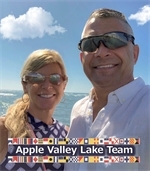 Joe also works as a Fireman and Paramedic for the local station - He has a passion to help, and problem solve - these qualities are key as well in the Real Estate business. Joe has a heart and passion for everything he involves himself in. He knows the area, the lake and the community very well. Our office manager and Assistant!